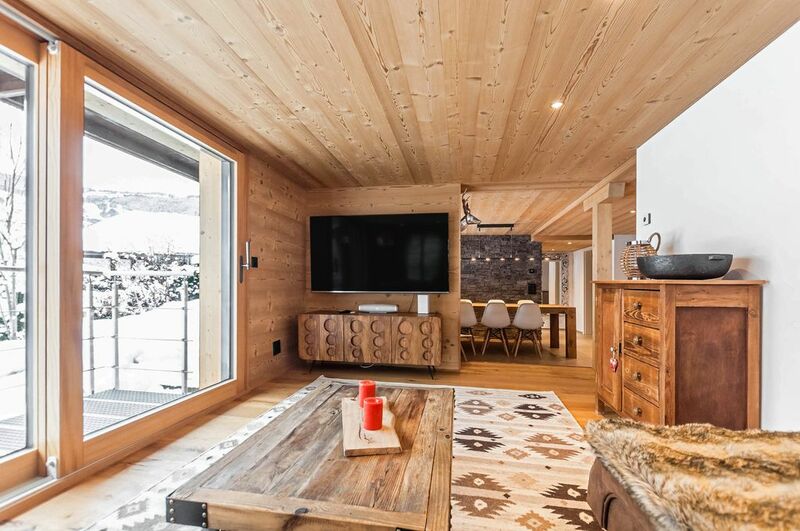 "The apartment is part of a small 2-storey chalet composed of 4 units in total. It is located on the ground floor and overlooks the wonderful Eiger North face as you are sitting at the dining table, laying on the couch in the living room or having a beer in the private garden (or a tea). The apartment has a large open space area with dining table, kitchen and direct access into the living room. Ideal for a family or a group of friends, willing to ski, hike or take a trip to the Jungfraujoch, the Kleine Scheidegg or Männlichen. Transportation to the train or cabins to these places are only 300m walk away. The centre of town is a 20min-walk uphill. The apartment has been fully refurbished during in 2016-2017 in an alpine style look with high-quality materials and offers 85m2 of comfort and nicely decorated space for you and your party. The central heating in the apartment allows you to control each room’s temperature to your desire and each room comes with dimmable lights so you can pick the atmosphere for the moment. Whether you simply want to sit on the couch and chat or watch TV & films on over 100+ cabled channels and Netflix or even connect to the world by surfing high-speed wifi internet, we have it all (and it is for free)! The apartment can accommodate comfortably up to 5 guests in two different bedrooms (+ one baby bed if required). One bedroom has a Queen-size Box spring bed (160x200cm) with an en-suite bathroom. Each person gets its own single duvets, so your partner or friend will not pull it all for themselves. The second bedroom has a tailor-made bunk bed for 2 guests (L-shape, not over each other) and a day bed for 1 guest. All are made in old wood and typical Swiss chalet style. Both bedrooms offer plenty of storage space into wardrobes (hangers available) so you do not have to live out of your suitcase during your stay. While sleeping is important to us, eating is even more :-) We love to cook ourselves and can ensure you that the kitchen is well-equipped. Appliances are all new and state-of-the-art. It includes a 200l fridge with a small freezer compartment; a brand new oven and induction cooker (4x hot plates); a dishwasher; a combi-microwave; a coffee machine; a toaster; a mixer and a milk foamer. If you’d like to experience prime Swiss cuisine of your own with cheese fondue or raclette, we have a set for each of them at home too. We obviously have all sorts of crockery and cutlery to make cooking easy and fun as well as sufficient glasses to enjoy wines, water and beer at the same time. The dining table in the open space living area is large enough for accommodating a couple of visitors for dinner and the induction-plates are overlooking the table so cooking won’t mean being on your own. If you are travelling with a baby or little kids, that's no problem, we've got your back covered as we are raising 3 little monsters ourselves. We can provide a baby cod and bedding as well as a high-chair and some cutlery for the little ones. When booking with us, you have access to the entire apartment for yourself. The apartment also has a little garden with a table and a BBQ to sit outside in the Summer. Additionally, you will be given access to a heated/lockable ski room located in the basement of the house to store your ski/sport equipment. There is one free car park on premise included in the price for our guests. We do not live in Grindelwald ourselves and as such not always in town when our guests are visiting the region. However, we are always available for via any channels: email, phone or the platform chat. We have a qualified team of professionals to support us on the ground and have created a digital guestbook with all required information to have a comfortable stay in our apartment. Our apartment is located on the ground floor of a two-storey house but has a number of steps outside and inside the property, which makes it not suitable for wheelchair access. Our prices include the tourism tax of CHF 4.- / night / guest and a ""tourist card"" will wait for you in the apartment." We always have sugar, salt, pepper, oil, vinegar, tea and coffee available in the apartment. Fully equipped kitchen with all appliances, including fondue and raclette sets.